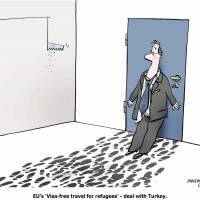 BERLIN - The first several hundred asylum seekers have been brought back from Greece to Turkey. At the same time, the U.N. High Commissioner for Refugees warns against the arrangement between the European Union and Turkey. The worry is that the non-Syrians among the refugees will now be returned forcibly to wherever they came from, regardless of what fate awaits them there. Amnesty International reports that Turkey is already forcing even Syrian refugees, including women and children, to return to their war-torn home country. Not being able to deal with the refugee crisis on the basis of its own resources and instead having to depend on Turkey’s help is a bitter defeat for the European Union and its goals. The resulting misery can be watched live every day in Idomeini, Greece, close to the Macedonian border, where 11,000 refugees have been left to the aid of NGO volunteers for months. As a result of its inabilities and perilous cooperation with Turkey, the Europe of 2016 may soon experience its very own “MS St. Louis moment” as the Americas once shamefully did. The MS St. Louis was a German ocean liner which, in 1939, brought 937 Jewish refugees from Nazi Germany to Cuba, after the Cuban Embassy had sold them visas for the then-horrendous amount of 150 pesos per head. The Cuban government canceled the visas and turned the ship away. Then, U.S. Coast Guard vessels prevented it from landing in the United States. After Canada too had closed its doors, the ship returned to Europe. During the war, between 220 and 250 of the ship’s passengers were murdered in the concentration camps. Ever since that time, the name MS St. Louis stands as a symbol for the shame North America brought upon itself when it closed its doors to refugees in need. Not every crisis, of course, can be solved without pragmatic compromises. In my view, however, the current refugee crisis is no such matter. Rather, Europe’s handling of the crisis represents a series of missteps and poor policy decisions. First, almost half a million Syrian people had managed to escape from their country’s civil war and were installed in camps in the neighboring countries. It should have been possible for Europe to help make those refugee camps livable temporary shelters for the people who would want to return home eventually. It also would have been far less expensive, in addition to less permanent, than resettlement in Europe. It also would have forestalled the human traffickers’ flourishing business. In the region itself, one dollar spent on refugees buys at least three times as much as it does once they have arrived in Europe. UNHCR had warned — in 2014 — that it was running out of funds. European leaders did not step up to fund stable camps. 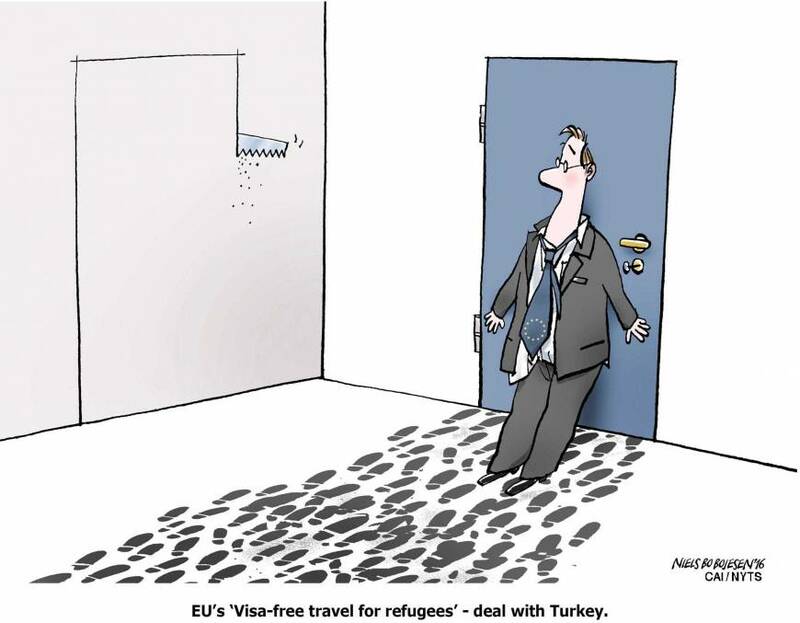 When camp subsidies had to be cut in half due to a shortage of available funds, sensible refugees made the rational decision to take the dangerous route to Europe. Even then, it would have still made sense to follow the EU Commission’s proposal to set quotas for which member country would accept how many of those refugees. Every cent spent for a refugee equals a shot in the arm for the economies of the recipient countries. But politicians simply shrank back, confronted with their electorates’ fears of immigrants stealing jobs or turning into terrorists. EU leaders were loath to stand up for the rights of asylum seekers and for human rights, as enshrined in the 1951 Refugee Convention and the EU Charter of Fundamental Rights. Thus, it may not be long until the first deaths will be reported from Afghanistan or Iraq where refugees have been sent back. And the problem will not even have been truly off-shored either. After all, it will not be long until the numbers of incoming refugees swell again — human traffickers guiding them on other routes, through Libya, through Italy. With the weather getting better as spring arrived, more than 4,000 refugees have already arrived in recent weeks in southern Italy. What will the EU do next? Handcuff them and ship them back on the spot? Political expediency and a shortsighted form of pragmatism has taken the upper hand over humanity and principles in Europe. And should tragedy befall those refugees returned forcibly to Turkey, it may bring back uncannily the ghosts of the “St. Louis” — this time in Europe.